I think this speaks for itself, doesn't it? The internets sez: "Since their meager budget did not allow for an original music score, producer Karl Hardman selected cues from the Capitol Hi-Q production music library which [director George] Romero masterfully edited into the film. The end result was spine-chilling. 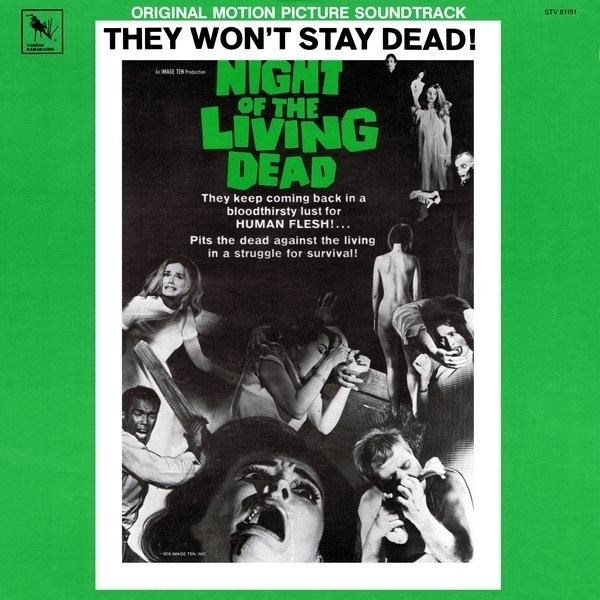 Although this same music had been used more than a decade earlier in low-budget efforts such as Teenagers from Outer Space, The Hideous Sun Demon and The Killer Shrews, it would become forever known as the soundtrack to Night of the Living Dead." Choice bits of dialogue are also included in this collection. Timely and delicious. Thank you. Could you imagine if Ed Wood had directed "Night of the Living Dead"? Criswell giving some sort of sanctimonious speech at the end would have been awesome. An Ed Wood Amusement Park has been a lifelong dream of mine. That's funny Soylent. I can just imagine: Greetings my friends! You are interested in zombies - that is why you are here! I have to know - what would (Wood?) that amusement park be like? Note: The entire park is painted in black and white to save money. - "It's Angora After All" plays as you ride through stock footage from around the world. This is great! One of my favorite flicks of all time. The music, although the stock canned variety, elevate any movie that used it mainly because of it's ties to NOTLD! I feel like Night of the Living Dead is one of those movies where just about anyone remembers where they were when they saw it for the first time. It's that kind of iconic movie. It was 1998 and I was ten, living at my old house before the family moved the next year. My older brother came home from the job he hated, being the China-Wok in town. He went to one of the video rental stores after and rented some movies, The Exorcist, Dr. Jekyll and Mr. Hyde, the 1920 silent version with John Barrymore (he knew I liked older movies and what rental store would rent out such an old film is beyond me), and Night of the Living Dead. He wouldn't let me watch The Exorcist, I was too young for that. But I was free to watch the other two. So late that night after everyone had gone to bed. I watched both of those. Jekyll and Hyde was quite good, I still think its the best take on that story, Barrymore is excellent and completely transforms as that character. Then at like 1 in the morning, by myself, I popped in Night of the Living Dead and my little ten year old self saw something he'd never seen before in his life. Its a movie with strange geometry, wild shot composition. Watching more mainstream films and alot of them growing up, you get used to a certain look. Clean pictures, the camera is usually a static thing, and even if it moves, its generally nice and smooth. Instead here, everything is chaotic, the picture is gritty, I don't recognize a single person. The movie feels like a documentary. Johnny dies in the first minutes of the film, which as a ten year old boy, I thought would be the hero. All expectations are immediately shattered. The movie has such a look and energy about it. The movie is almost like a campfire story, alot of the story comes through the radio and tv broadcasts when the main characters aren't constantly fighting. Its strange and mysterious and no one really knows anything. Its a very different sort of story from the ones I generally watched like War of the Worlds, or The Thing From Another World. You constantly hear about these beings eating people, but you only see it happen twice in the film. And both times they're fairly removed scenes compared to the cannibalism you see generally in other zombie movies. Usually someone is getting torn in half and they're screaming their head off and they get to see the color of their own intestines and what not. Instead in Night of the Living Dead, two characters are blown up, and the ghouls eat the cooked remains. Its more ghastly and macabre than anything, and of course there's that solid spook music to go along with it. In the case of the little girl eating her mother, that is almost an afterthought compared to the Psycho envisioned stabbing that preceeded it. That moment is trippy on its own seeing a child murder her mother. And then of course the ending, everyone dies. You just didn't see movies like that, it left me with an utterly cold feeling. I mean, I saw Alien before that, and a completely harsh and amazing movie on its own, didn't leave me with that kind of feeling after I'd seen it. After seeing that big bonfire at the end of the movie that I know our movie's hero is in, I just kind of didn't do anything for the rest of the night. Didn't go to sleep right away, I just kept thinking about this utterly bizarre movie I just watched. It's a classic. The only other movie that kind of recaptured that feeling for me was watching Evil Dead for the first time when I was thirteen, which to me, is a perfect age to see both of those movies. I remember the first time I saw it. I was 12 and staying alone with my grandparents at their secluded vacation home that was, basically, in the middle of the woods. I don't really know what made them think that letting a 12 year old rent a movie titled "Nigh of the Living Dead" was a good idea but, there I was, alone in front of the TV, watching what was basically my first "adult" horror movie. What I remember most is the terrifying, batlike shrinking from Helen as her daughter stabbed her to death and not being able to sleep that night with all the sounds from a large, empty house. I ended up spending that night in bed with my grandparents after terrifyingly walking up the stars and knocking on their door. Definitely one of my favorite horror movies.